The STX Series represents the ultimate in astronomical imaging systems. The integrated design allows the user to select either Ethernet or high speed USB 2.0 connection to the control computer. The Model STX-16803 uses Kodak's KAF-16803 CCD with 16 million pixels at 9 microns. The sensor measures almost 37mm square. The built-in tracking CCD is a Kodak KAI-340S with 640 x 480 pixels at 7.4 microns. The STX series has superior cooling to -50 degrees C below ambient with air only. Water-cooling is also possible. STX cameras have internal voltage regulation and may therefore be operated directly from any unregulated 12VDC, 6 amp source. Built-in Guiding CCD with Adjustable Focus: The guiding CCD in the STX cameras will be a new KAI-340 CCD with 640 x 480 pixels at 7.4u. The KAI-340 CCD will also be used in a new Remote Guide Head made for the STX series cameras. As the imaging CCDs get larger, the guiding CCD gets pushed farther away from the center of the optical axis. Depending on the nature of the optical system, this can cause the image on the guiding CCD to be slightly out of focus when the image on the main CCD is in focus. To address this, the new STX cameras will have a user accessible adjustment for changing the focal point of the on-board guiding CCD. Both USB 2.0 and Ethernet are available on STX cameras. The user will not have to choose the interface at the time of purchase. The STX cameras has the same convenient I2C AUX port that we use on the ST and STL cameras for power and control of accessories such as filter wheels and Adaptive Optics, and will operate from any unregulated 12VDC source. The STX series cameras has a full frame image buffer for storing image date during download. We are exploring the possibility of using this buffer for pre-processing pixel defects based on a defect map provided by the CCD manufacturer, at the user’s direction. Our engineers have modeled an optimum cooling design for this camera using a large custom pin grid array heat sink mated directly to the hot side of the 2 stage TE cooler to achieve maximum heat dissipation with a single large fan. The STX will achieve a typical temperature delta of -50 degrees C below ambient with air only, and a similar delta with water only. While the design is aimed at sufficient cooling without water assist, it is possible to use water instead of air or in addition to air for optimum cooling. Using water instead of air will not require the use of a fan. Chilled water may also be used alone or with the fan for even greater cooling. If the user desires air cooling only, the fan speed is controllable through software. Variable speed control allows the user to "tune" to fan to eliminate any resonance with the user's telescope thus suppressing harmonic vibrations. 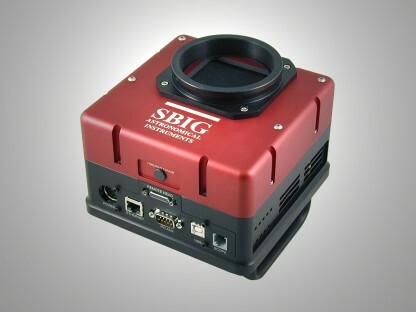 From the first ST-7 camera, SBIG has incorporated an even illumination shutter for taking short exposure flat field frames on all self-guiding cameras. However, the rotating disk design becomes rather large with ever increasing CCD sizes. Therefore, a new shutter design is used in the STX series that reduces the overall size and weight of the camera body, while maintaining even illumination on short exposures with large CCDs, something not found on any other astronomical CCD camera with a CCD this large.